*By subway, take the F train to the "2nd Avenue" stop. From the station, take the "1st Avenue & Houston Street" exit and walk north on 1st Avenue away from Houston Street. Make a right on East 3rd Street and walk 2 and a half blocks until you reach #236. This year's National Puerto Rican Day Parade celebrates Puerto Rico’s natural beauty. It is a beauty whose future rests in our hands. Whether we take action in the States or in Puerto Rico, we have to protect the places we love, so that future generations can enjoy them too. National Puerto Rican Day Parade, Inc., in conjunction with the Sierra Club of Puerto Rico and the Conservation Trust of Puerto Rico, is representing the Natural Beauty of Puerto Rico throughout the Parade and its events making it the official theme of the 54th parade. 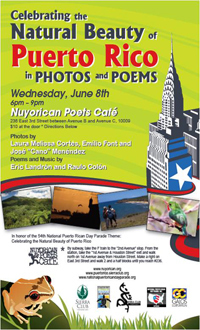 In the theme’s signature event, on Wednesday the 8th of June at the Nuyorican Poet's Cafe, local members of the Sierra Club have represented the Island’s Natural Beauty in photos that are the basis for a series of poems written by Puerto Rican poet Eric Landrón. Landrón will present the poems accompanied in guitar and song by Singer/Songwriter Raulo Colón. The Coalition for the Northeast Ecological Corridor, Casa Pueblo, Citizens of the Karst, Uprose , The National Puerto Rican Coalition, Comité Noviembre, Institute for the Puerto Rican/Hispanic Elderly, Cemi Underground.